The Constitutional Council convenes Friday to discuss its first case in years. Elections Board Chair Betty Zhang (20C) told the Wheel that she plans to resign from her position after the Constitutional Council recommended she resign or be impeached. In its first case in years, the Constitutional Council upheld incoming College Council (CC) President Radhika Kadakia (20C)’s victory in the elections and admonished Zhang’s actions during the elections cycle. Zhang informed SGA President Gurbani Singh (18B) of her resignation through text message on Tuesday, but Zhang plans on sending a formal email resignation on Wednesday, Singh told the Wheel. The Constitutional Council’s recommendations came after two CC legislators filed a complaint with the Constitutional Council regarding the Elections Board’s exception for Kadakia’s late declaration to run for CC president, the Council recommended SGA take no action in the 2018 College Council (CC) presidential election results that saw Kadakia win with 640 votes (51.45 percent). The Constitutional Council called for Zhang’s removal “considering the myriad of issues regarding her actions during the 2018 election cycle,” according to the March 30 case decision. “I appreciate the Constitutional Council’s decision and the efforts of the justices in seeing this case so thoroughly,” Zhang wrote in an email to the Wheel before she confirmed that she was resigning. In their appeal to the Constitutional Council following the Elections Board’s unanimous denial of their challenge, the legislators challenged the Elections Board’s decision on three counts. Giufurta and Garbee contended that the Elections Board “allowed Kadakia to run based on misinformation; the Board of Elections did not have the authority to add late candidates for the sake of a ‘contested election’; [and] Kadakia’s late declaration was a violation of the Election Code,” according to the Constitutional Council decision. 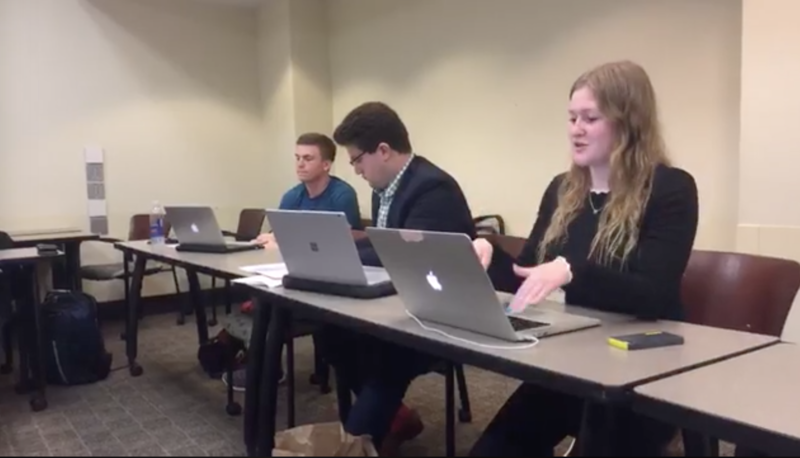 Giufurta and Garbee argued that the Elections Board’s decision to unanimously prohibit Sania Chandrani’s (19B) candidacy for SGA president should have also applied to Kadakia; both candidates should not have been allowed to run if the same standards were set. Zhang said that the Elections Board did not think it would have been fair to prohibit Kadakia from running since the Board had already granted an exception for Karras. Zhang confirmed that she sent both Kadakia and Chandrani a locked Google form to declare their candidacy after the deadline had passed. Kadakia responded to Zhang asking her to unlock the form, while Chandrani did not. Zhang said this was the sole reason why Kadakia was allowed to run and Chandrani’s appeal was denied. Zhang did not communicate with Chandrani any further and said she took Chandrani’s lack of response as an assumption that she was no longer interested in running, despite the fact that Chandrani had emailed her before the March 18 deadline declaring her intent to run for SGA president. Giufurta and Garbee also criticized Zhang’s incorrect belief at the time of deciding Kadakia’s case that the CC presidential race was uncontested. Zhang said in the hearing that she “neglected” to check the Google form containing the list of all the declared candidates for CC president because candidates are allowed to change the position they are running for up to 72 hours after the closing of declaration of candidacy — a deadline that had not yet occured. At the hearing, Zhang confirmed that she took Jain’s words at face value without confirming their accuracy. Giufurta said he perceived the board failed to act in an impartial manner when considering Jain’s argument. At the hearing, Giufurta and Garbee asked for a retroactive redaction of Kadakia’s candidacy if possible, or if not, for the case to serve as a precedent for future election processes. In their ruling, the Constitutional Council found the actions taken by Zhang “to be fundamentally unfair to the candidacy of Chandrani,” one of the factors that led to them to recommend for Zhang’s dismissal. The Constitutional Council acknowledged that their decision is “unfair” to Chandrani’. The Constitutional Council also dismissed claims that the Elections Board acted outside of their constitutional authority by allowing multiple candidates to declare late. The Constitutional Council also recommended that the SGA “pass a bill that prevents future key election dates, including deadlines for candidacy and voting periods, from occurring during any school-sanctioned break, such as spring break, or during major religious holidays, to prevent a recurrence of many of the issues plaguing this year’s elections.” This year, the deadline to declare was the Sunday that spring break ended. Update (4/3/18 at 11:38 p.m.): The article and headline were updated to reflect Zhang’s resignation as chair of the Elections Board.